Welcome to The Hollow Sword, an exciting adventure featuring the recently orphaned Jake and his new friend Anna. The Hollow Sword is the first book in the Kernow Trilogy. 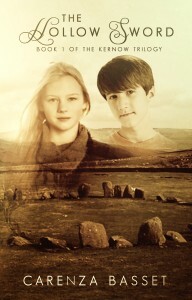 Teenager Jake, suddenly orphaned, is taken by his Aunt Cara to live in Cornwall. Cut off from his previous life and banned from contacting his old mates he makes friends with Anna, a local girl. He also discovers a strange ability to draw, particularly of places he’s never seen. Together, Jake and Anna face unknown dangers as they unwittingly become involved in a quest for an ancient artefact. The story retells many of Cornwall’s Myths and Legends such as the story of Lyonesse, the lost land off the Cornish coast that sank beneath the waves, and the story of the Merry Maidens who were turned to stone. Jake also encounters mermaids and silkies, midsummer bonfires and a murder of crows! The big problem is that Jake doesn’t know what he’s looking for and he’s not certain who he can trust. Follow him and Anna as they travel through time and place to a dramatic conclusion.